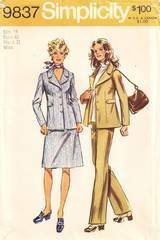 Unlined jacket with front button closing, notched collar. Button trimmed tabs stitched in side seams and fastened to front. Skirt and pants with side zipper and waistband.